Thank you to Vella from Wench Designs for this award - very much appreciated! Thank you to Missladyhawke for the "Friendship Around The World" Award. I agree with your post on your blog too - it is a honour to receive it. 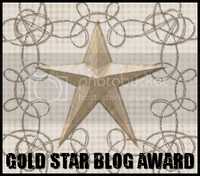 Now I'm supposed to pass these on to three other blogs but everywhere I go it seems everyone has already received this award and others so I'm having a bit of difficulty with that lol. I thoroughly recommend all the blogs I have listed in the side bar >>>> and visit them often.